It's amazing what you can find in a Soviet suburban wasteland. Given more than the hitherto customary two days in Bukhara, hire a taxi for half a day and take a swing round the south circular, starting just inside it, not far from Samani Park, at the Balyand mosque. The imam will not let Russians in; demonstrate your foreigners. It's worth it for the lavish early 20th - century tile work in and around the mihrab, and for the painted wood ceiling (which hides the beams of the actual roof). The basic structure is early 16th - century, and the corner colonnade typical for a parish mosque. At the next roundabout, half a mile south-east, there is a building of grandeur and desolation: which quality dominates depends on your mood and the light. The Namazgokh mosque was first built in 1119-20 by Arslan Khan, the Karakhanid who built the Kalyan minaret, and some of his west wall, with precious pre-Mongol decoration in brick, terra-cotta and stucco, survives under the main 16th - century structure. This was a big mosque but was intended only for special twice-yearly holiday prayers. It looks best in the evening. The Buyan Kuli Khan and Saif ed-Din mausoleum form half of an extraordinary double act in which medieval Islam meets obsessive 20th-century industrialization. The other half is a busy railway shunting yard south-east of the Old Town off Sholkomotalnaya Ulitsa. 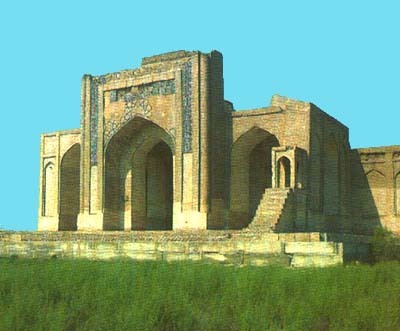 The Buyan Kuli Khan mausoleum (1358), resting place of a Mongol Khan killed in that year in Samarkand, is a rare survivor of Bukhara's long, depressed post-Mongol resurrection. The majolica-work round its front door rivals that of Samarkand's Shah-i-Zinda complex, and is shaken all day every day by goods trains passing a few feet away. The Saif-ed-Din mausoleum next door commemorates Sheikh Saif ed-Din Bokharzi (1190-1262), a popular poet and theologian who survived Genghis Khan's visitation and probably funded one of this district's many khanagas for the poor and homeless. The mausoleum is roofless and so plain that it was long thought to date from the 13th century, though in fact it dates from the 16th. Both buildings are surrounded by huge piles of concrete pipes. Back on the Ring road it is a short drive north to the handsome Faizabad Khanaga (1598-99) on Ulitsa Suleimana Muradova, which gave traveling dervishes temporary shelter on three floors of cells. It is normally closed but an Intourist guide may know where to get a key.